A hazy beam of sunlight throws a vertical swath of light on the wall, making a bright smear on the washed out pattern of the wallpaper. The paper must have been ivory colored once, but now it is a dirty shade of cream, fading to yellowish brown. The peeling edges lift off the wall like the curling dog-eared pages of a well worn book, in places torn to reveal the dull blue of an earlier print. Along the path the sunlight takes as it creeps up the wall, the paper has bleached, evidence of long tenure. In a corner across from the window, an iron frame bed leans drunkenly against the wall, looking like it might collapse without additional support. The frame was once painted black, but all vestiges of color have peeled away, leaving only bare metal, interspersed with darker splotches of rust that contrast vividly with the incongruous emerald green of the coverlet. The bedspread seems relatively new and the small images of romping cats scattered across the surface seem like a sick joke in contrast to the severity of the room. At the foot of the bed stands a battered brown suitcase, its leather scuffed and scratched. The zippers are broken, the tabs missing and the case is now secured by two straps, curling and worn smooth from much use. There’s a wooden clothes horse in the left corner, adjoining the window. On its rungs hang a faded pair of blue jeans along with two threadbare grayish t-shirts. The shirts may have been black once, but repeated washing seems to have leached all the color from them. The other corner hosts a small metal table and a folding chair. Paraphernalia litters the table; a thin length of latex rubber lies like a flaccid snakeskin beside a tarnished silver spoon and a partially used spirit lamp. A disposable hypodermic syringe has rolled to a stop against the lamp, and resting near it is a crumpled scrap of foil paper, an orphan from the overflowing ashtray. The ashtray, once the property of the Happy Family Peking Diner, is the cheap tin kind that everybody steals. The remnants of a dozen cigarette butts, the unfiltered kind, fill the bowl. The ash tray, once gilded, is now black with the detritus of innumerable mashed out smokes. The smell of stale tobacco fights for supremacy with the scent of Lysol air freshener, creating a strange pungent odor that is not altogether unpleasant. The sunlight barely illuminates the room, even though it is still early afternoon. The window is grimy, and the inside surface is streaked as if someone has tried to scrub it clean with paper. The outside of the glass pane is spotted and patchy where raindrops briefly liquefied some of the grime before hardening it into a new pattern; layer upon layer of cloudy whorls that filter out most of the light. The view outside is bleak; dominated by the brown brick wall of another building, all the windows shuttered. The light in the room will vanish when the setting sun disappears behind the rooftop of that building. 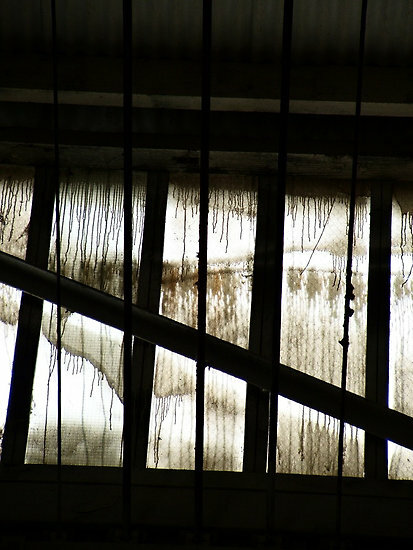 A single light bulb hangs from the ceiling by a length of wire, as grimy as the window itself. The bulb is bare and unlit. In the wan light diffusing into the room, the wooden floor seems streaked, the result of many repairs that have matched neither the grain nor the type and shade of the wood. The boards look stained and dull, the surface lacquer long since gone and the wood darkened to a chocolate luster with age. The sound of a jack hammer drifts up through the imperfect window seal, the rhythmic clatter mingling with the sound of shouted voices from out in the hallway. On the other side of the wall, a baby cries, providing a monotonous background to the rhythmic thud-thud of a boom box with the bass turned up loud. The walls are like acoustically permeable membranes, making privacy altogether impossible. A cheap mirror hangs on the back of the closed door, reflecting the interior of the room in unflattering detail. Above the mirror, someone has screwed in a couple of cheap metal hooks. A white bathrobe, relatively new, occupies one of the hooks, a puffy cumulus smudge against the dull leaden backdrop of the door. It is one of the few things in the room, along with the suitcase and the jeans, that clearly belongs to someone. Curiously, there are no electrical or mechanical contrivances of any kind in the room. This, added to the lack of furniture, makes the room appear bigger than it really is, an illusion accented by its Spartan emptiness. The entire aspect is one of impermanence, as if the entire room is transient, primed to transform in a moment at its owner’s whim. But there is no living thing here. There hasn’t been for days. Eventually, the landlord will come looking. Come when the pre-paid rent has run out. But by then the Lysol scent will be long gone, replaced by the growing odor of putrescence and the grotesquely swollen foot and ankle protruding from under the trailing edge of that emerald green coverlet.